The Book of NO: 365 Ways to Say It and Mean It and Stop People-Pleasing Forever - Parenting Expert, Susan Newman Ph.D. The Book of NO: 365 Ways to Say It and Mean It and Stop People-Pleasing Forever - Parenting Expert, Susan Newman Ph.D.
stress, regret, and feelings of powerlessness. say “no” without feeling guilty or damaging your relationships. Harness the power of “No” and take back your life. See tips below. Saying no means making a conscious effort—choosing—to be in charge of your life. Save “I’m sorry” for when you have actually done something wrong. Turn down those who flatter or attempt to pressure you into a yes. Saying no is very often a time management issue; pay attention to what you have to do before accepting. Always request details before agreeing to what is asked of you. Refuse anyone who insists on an immediate answer. Whatever you say “yes” to will eventually force you to say “no” to something and somebody else that you really want to help. Not every friend has to be your closest, or deserves your complete devotion. Children get over disappointment far faster than adults. Your kids are more resilient than you probably realize. With or without pressure, constantly acquiescing places a needless burden on you. More no answers mean less exhaustion and the reduced likelihood that you are operating on a short fuse. Guilt is a wasted emotion; it eats up time and is almost never worth the drain on your mental health. Having a reputation for being the person everyone leans on is not flattering and makes you a prime target for being railroaded into more yeses. When you say no, people are not thinking about you as much as you worry about what they’re thinking. Only say yes to the people you truly want to assist and who are apt to return the favor. A colossal, common, and vexing problem, which causes many other devilishly inescapable problems, is not saying ‘No’ before ‘Yes’ leaps out of your mouth. In this priceless, practical, pithy volume, Dr. Susan Newman uses her wisdom, wiles, and wit to teach you—kind, nice, good, and giving person that you are —how to bow out gracefully, how to decline an offer without giving offense, and how to teach others to do the same thing. This book is a game-changer and a life saver! If you want to be a good friend, team player, and nice person, but always seem to put yourself—and the things you want—last, The Book of No is for you. It helps break down the stigma and guilt associated with saying no, and provides hundreds of practical tips for exactly how to say it in specific circumstances and relationships. You’ll learn the psychology behind why you get sucked into saying yes too often and what to do to stop. The Book of No is a must-read for the pushover tendency in all of us who agree to most things asked of us. Leading relationship psychologist Susan Newman explains you why you say “Yes” too often and how to say “No” graciously without feeling guilty or offending. Think of it as your life-preserver and go-to guide for navigating relationships with your friends, family, spouse, boss, co-workers, parents, kids…even strangers. You’ll want to say “Yes” to The Book of No and keep it close by. Sometimes you have to say ‘no’ so you have time to say ‘yes’ to what really matters—the things that are important to you, preserve your health, and add to your happiness. That’s the powerful takeaway message from this realistic guide to kicking the yes-habit and embracing the power of no. The Book of NO gives people the courage to stand up for themselves. Reading it is both helpful and a delight; you find yourself sighing with gratitude, feeling freer because you have the exact words to say “no,” and thinking who else in your life needs this book. All too often we find ourselves overworked and overstressed because we take on too much at work or at home. In short, we have trouble saying “no”! Dr. Susan Newman’s book is an essential guide for those of us who are too agreeable, nice, or helpful, and really don’t know how to set critical limits. In a world infected by instant gratification and murky boundaries, saying “no” – and sticking to it – is quickly becoming a lost art. The good news is that Susan Newman is here to help. Using detailed examples, humor, and actionable steps, Newman helps us explore our own obstacles to setting and maintaining healthy boundaries and empowers us to put an end to personal overload. In saying “yes” to “no”, we just might make a dent in putting an end to our current culture of busy. For many of us, it’s very difficult to say no. We’re asked to take on extra assignments at work and help colleagues and clients with projects that might be outside our official job description. We’re asked favors by our friends, by our families; and sometimes even by our LinkedIn connections. And yes, it’s nice to help, but we can end up overburdened. In The Book of No, Susan Newman offers great strategies and tips for learning to say no. This book is going to be my new go-to volume for putting a bit more “no” in my life — and in the life of my clients, colleagues, and friends. 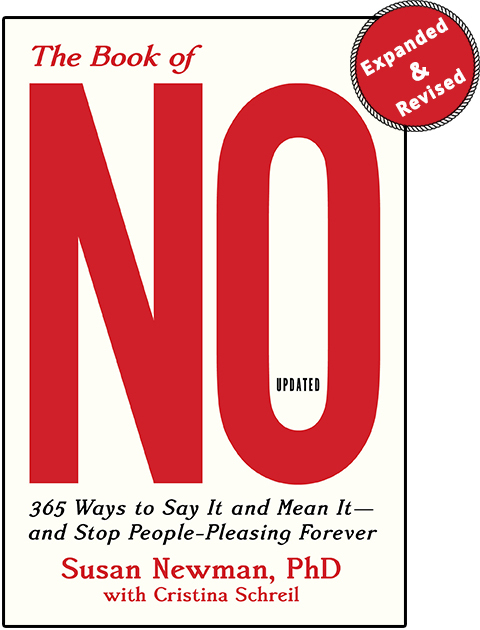 In this updated edition of The Book of No, social psychologist Susan Newman offers research and immensely practical tools to help us set boundaries and stop people-pleasing. The book is fun, easy to read and provides scenarios like requests to look after a relative’s children, drive your teen to the mall, or give up your weekend plans to do last-minute work. Along with each scenario are specific dialogues that demonstrate exactly what to say. The “No” responses are right on target – assertive and clear, yet respectful. So many of us struggle to skillfully set boundaries without hurting our relationships. This book is just what we need! A wise and practical guide to living a life that fits your personal values, Susan Newman’s newest book is a treasure trove of realistic scenarios and thoughtful responses to help you let go of commitments that leave you feeling resentful and depleted. Whether it’s a whining child or a demanding acquaintance, a guilt-tripping relative or an unreasonable work colleague, The Book of No offers do-able strategies for setting healthy boundaries so you can say “Yes!” to the things that truly matter to you. This book will free you. It is one of the most liberating, empowering and practical topics I’ve seen…and Susan Newman does a masterful job bringing it home. The skill of saying ‘no’ is essential for a life of freedom and dignity. Dr. Newman’s book, through a series of carefully analyzed examples, teaches that skill. This is a must-read book for anyone who tends to say “yes”—and needs to learn the power of “no.” For example, there are those who have the “disease to please,” or who want to avoid possible confrontation or unpleasantness, or who have difficulty prioritizing or setting boundaries…However, saying no is an important skill. It can help individuals protect their time, balance relationships, safeguard their health, create positive change, stay on course, and feel more purposeful. In The Book of NO, author Susan Newman helps people learn to say NO, illustrating this by way of short sample scenarios—addressing many authentic, sticky situations that arise with friends, family, work colleagues, forceful people, and more. She reveals what’s really going on, how to respond, and how to stay alert. Newman writes, “Before you can fully embrace no, you have to understand why no is important.” She does an excellent job conveying that, and helping readers operationalize it. It [The Book of NO] is rich, readable, and all-too-relatable for those of us who struggle to say “no” with authenticity, confidence and kindness. The book offers brief dialogues for hundreds of scenarios in which “no” is the right answer, for reasons ranging from time management to financial pressures to emotional boundaries. Newman considers scenarios that pop up among friends, at work, within families and in parenting. Do you think this book might be helpful to you? It’s ok if the answer is “no,” but I do highly recommend it.